Allergy Advice: Contains Wheat Gluten, Soya Bean, Fish, Crustacean (Shrimp), Peanut, Sesame, Egg. May contain traces of oat and mollusc (scallop, abalone, oyster). Ingredients: Noodles: Wheat Flour, Egg White, Salt, Acidity Regulators (E501(i), E500(i)), Emulsifier (E322), Water. Sauce Sachet: Canola Oil, Peanut Powder, Seafood Flavour & Flavouring (Fish), Salt, Sesame, Soya Sauce (Water, Soya Bean, Salt), Sugar, Flavour Enhancers (E621, E631, E627), Dried Shrimp, Garlic, Chilli Powder, Ginger, Colours (E150a, E160c), Pepper Powder, Preservative (E202). 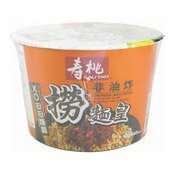 Simply enter your details below and we will send you an e-mail when “Mix Instant Noodles Bowl (XO Sauce Dandan Mian) (壽桃XO擔擔撈麵)” is back in stock!